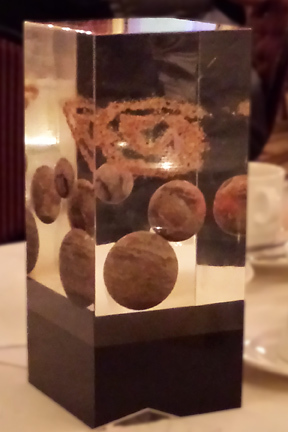 Nebula Award, sitting on our table! I have never been to an Oscar ceremony. I can’t even foresee the time stream in which that might happen. 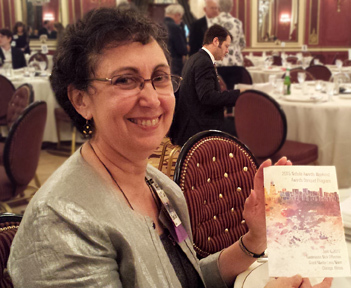 The 2015 Awards (honoring fiction published in 2014) were held in Chicago this year. I’ve always wanted to go. Cookie, being the excellent sport that she is, came along to provide moral support. We actually went for the whole weekend (a bargain at $90—not including hotel and meals), from Thursday through Sunday, though Cookie didn’t hang around for all the panels. She had things to do, places to go, and people to see. She went to a few, though, and we went to the banquet together. We weren’t nominated for any awards, but we got to sit with people who were. 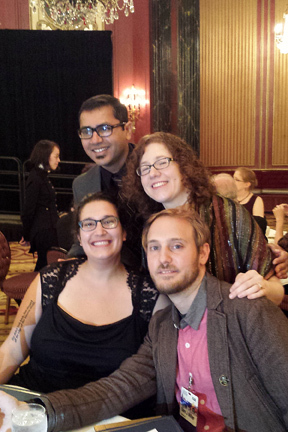 They were all wonderful people, so I’m sorry to report that none of them carried Nebula awards home. Please support them! Buy their fiction! If/when you join SFWA, vote for their stories! You can have people who really know their stuff pouring their heart into a piece, and they can totally nail it. They then end up nominated for a major award like a Nebula. But out of a field of, say six or seven nominees, only one is going to take the Nebula home. You might think the rest of them would sit around and mope. That is not what I saw. I saw a community of friends cheering for each other. My favorite memory of the evening came after the actual awards ceremony. Many of the nominees who hadn’t won gathered in a vestibule to deliver their Alternate Universe speeches. In each Alternate Universe, the speechifying nominee had won the Nebula. These speeches ranged from humorous to extremely affecting, and each was greeted with sincere appreciation by the other nominees. I came away delighted by this community I’d stumbled into. The Nebulas return to Chicago in 2016, for one more year. I can’t wait. For a list of the full 2014 slate, click here. To see who won in 2014, click here. This entry was posted in Celebration, Writing and tagged Carmen Maria Machado, Nebula Awards, Nebulas, Sam J Miller, Sarah Pinsker, SFWA, Usman Malik on June 9, 2015 by brennancm.